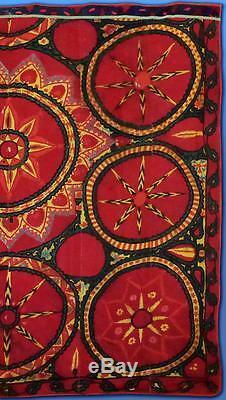 RARE THE 19TH CENTURY ANTIQUE UZBEK SILK HAND-EMBROIDERY SUZANI TASHKENT T1038. 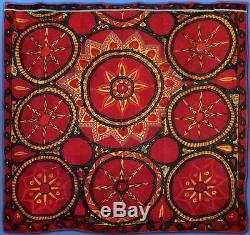 I'm proud of to offer a rare dramatic Suzani from Tashkent, Uzbekistan. Handmade embroidery with natural silk threads on home made cotton Karboz. 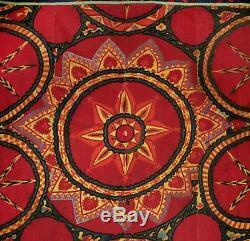 Size: 84 x 83 in/213 x 210 cm. 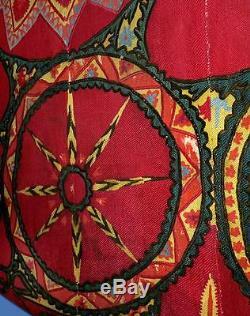 Such design traditionally calls moons or Palyak in Tashkent. The whole composition made an impression of something dynamical, streaming. A bold large rosette in Samarkand called lola, "a tulip". However, the initial meaning of this word was forgotten long ago; seamstresses understood it as the name of a round floral motive. The following names of rosettes - Oy (the moon) accustomed in Tashkent, and Oftob (the sun) accustomed in Bukhara. 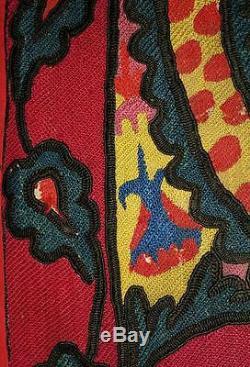 Usually bright, rich, different-styled art of Central Asian decorative embroidery is one of prominent manifestations of the artistic culture of nations of this region. All the regions where the production of large decorative embroideries is confirmed reliably enter area of Sogdiana. Perhaps, the place of origin of this peculiar art should be sought exactly within its boundaries. Large decorative embroidered panels became famous in Russian and Europe under the name "Suzani" means needlework, as "suzan" is the Tajik for needle. Suzanies in different regions differ one from another by many style features such as coloring and elements of ornament and its composition used for identification of specimens in cases when an embroidery has no exact certificate; however, such not always can be done absolutely sure because, firstly, not all local options have been studied in detail and, secondly, similar-type embroideries can be met in different regions, not to mention direct borrowings of or mixing of features. Motives at a Suzani were united not logically, with a plot but just in compliance with the beauty canons that were established and dominated in a respective embroidery region at a certain period of time. This principle of building of ornamental composition was typical for the whole Central Asia. Suzani-type decorative embroideries initially were caused by vital needs: they were used for laying a bed, their main kinds emerged as a bedspread, a bed-sheet and a pillowcase; such designation of embroideries was also reflected in their names: Suzani, in the narrow sense, means "embroidered bedspread". Given that Central Asian people used to sleep on the floor and that bedclothes of whole family were taken away and kept in pile in daytime, the question is about use of embroideries for sleeping: indeed, people slept on them and used them as a cover. Such was compulsory for newlyweds; in Samarkand, embroideries remained in use a set of a bride's dowry was worn out (people used to say, "doshta darrondem"-torn in use). 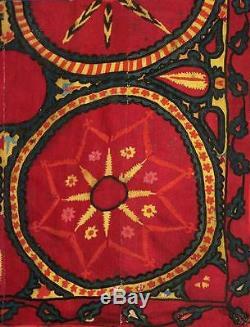 The domestic use of embroideries also had its peculiar, ritual nature related to the survivals of ancient folk beliefs: either embroideries on whole or their separate patterns, as people understand them, carried the magical character, served as a talisman for newlywed pair and saved from the evil eye. The magical importance of embroideries was not only laying a bed of newlyweds. In some locations (Tashkent, Ura-Tube), a bride was brought toward a fiance's house under a suzani as a canopy; in Samarkand where a bride was ridden on a horse, she was covered with suzani with her head under it because she was to leave her parental house for her new family's house. Both rituals were considered a defending, magical means. 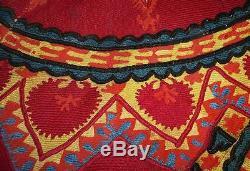 Suzani were embroidered according to a preliminarily drawn cloth pattern. Self-made soot ink was used for light cloth embroideries, and a bright-colored substance, for example, clay, sometimes with a light mixture of syrup was dissolved in water for the making of dark cloth embroideries. The drawing of patterns was performed by she-specialist graphic artists (Kalamkash or Chizmakash). They drew with cane pen (also used for writing) or little pointed stick. The technique of local graphic artists radically differed from the European techniques of drawing that proceeds from whole to particulars. On contrary, embroidery patterns were put into a cloth starting with details. To be saved or save she who an embroidery was designed for from the evil eye, sometimes, they sewed a small black bead with white spots (Kuzminchok) against the evil eye among patterns. Insignificant, purposefully ignored defects that could be seen in almost every embroidery were explained by fear of the evil eye: usually, a certain insignificant part of a pattern was not embroidered or embroidery was made with an insignificant technical defect so viewers neither were too much astonished with its perfection nor an embroideress's skill. It was accustomed to leave embroideries a bit incomplete so that families could see no end of holidays (wedding and circumcisions) which the embroideries were prepared for. This item is offered with No Reserve, that allows to you feel free. I'll be glad to answer any questions. Create listings that get noticed! With Auctiva's 1,800+ Templates. The item "RARE THE 19TH CENTURY ANTIQUE UZBEK SILK HAND-EMBROIDERY SUZANI TASHKENT T1038" is in sale since Tuesday, March 20, 2018. This item is in the category "Antiques\Linens & Textiles (Pre-1930)\Embroidery".